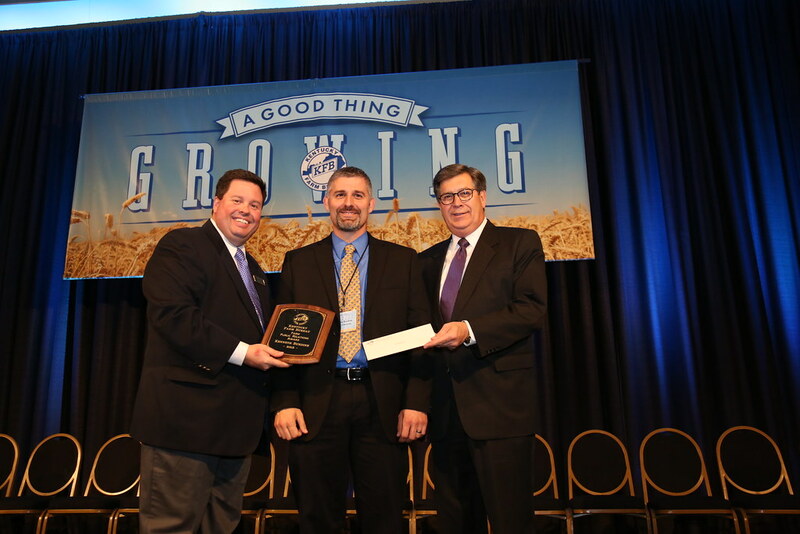 Louisville, KY (December 4, 2015) – Dr. Kenny Burdine, an Extension Livestock Economist and Assistant Extension Professor at the University of Kentucky (UK) College of Agriculture, Food and Environment, is the recipient of Kentucky Farm Bureau’s (KFB) 30th annual Farm Public Relations Award. He was recognized on December 3 during the general session of KFB’s annual meeting at the Galt House in Louisville. Dr. Kenny Burdine (center) received the 2015 Farm Public Relations Award at Kentucky Farm Bureau’s annual meeting in Louisville. Presenting the award is B. Todd Bright, KFB Communication Division Director (left), and David S. Beck, KFB Executive Vice President (right). Dr. Burdine, a native of Jessamine County, has worked at UK for 15 years. During this time, he has traveled extensively across the state conducting educational programs for beef, dairy, equine and forage producers in the areas of market outlook, profitability and risk management. He has also been a regular speaker at livestock programs outside of the state. Dr. Burdine is currently serving his second term on the Kentucky Agricultural Finance Corporation board, serves as chair of the North Central Extension Farm Management Committee, and treasurer for the Kentucky Forage and Grassland’s Council. He has also been named Outstanding Extension Specialist by the Kentucky Association of State Extension Professionals in 2005 and 2012. In addition to his Extension work, Dr. Burdine teaches a livestock marketing course in the Department of Agricultural Economics. Graduating with his bachelor’s and master’s degrees, along with his Ph.D. from UK, Dr. Burdine is also active in developing print publications for livestock producers and has authored or co-authored 45 Extension publications while at UK. Zack Ison, President of the Mercer County Farm Bureau Federation nominated Dr. Burdine for the award and said his dedication to the agricultural message is unparalleled and his passion for agriculture is evident in his work.